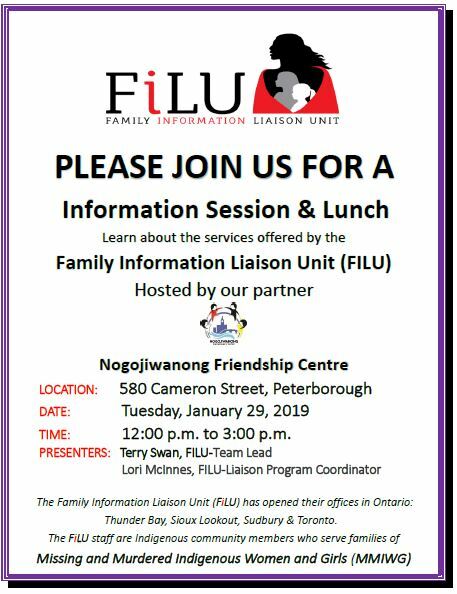 Family Information Liaison Unit and Nogojiwanong FC are offering a lunch and information session on Tuesday, January 29th 12 pm – 3 pm. 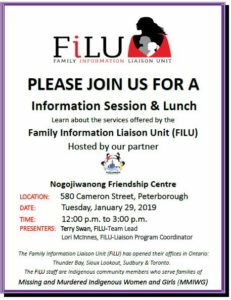 Join us to learn how the FiLU staff support family members of Missing and Murdered Indigenous Women and Girls (MMIWG). FiLU staff are Indigenous community member working within the Indigenous Justice Division of the Ministry of the Attorney General.